Researchers have trouble writing complex scripts to train machine learning models. Tools like Tensorflow Playground and Azure ML don't allow simple visual editing of neural networks with export to Keras that can be used anywhere. Such a tool would make many lives easier. 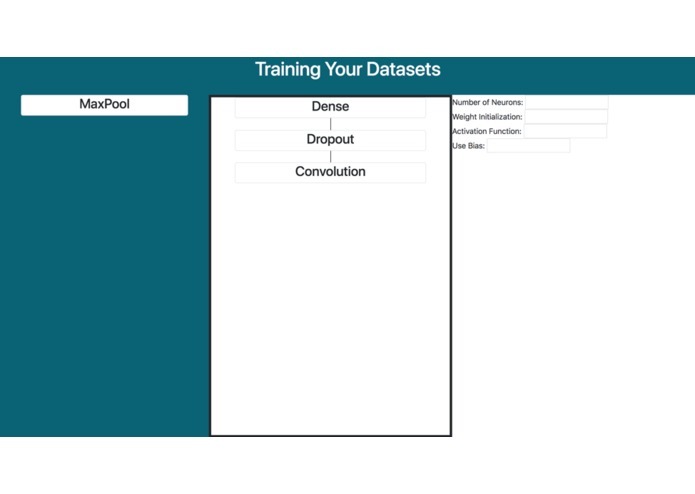 Allows researchers to use a simple tool to build complex neural networks to supplement their research. Developing drag-and-drop GUI. Porting files into keras, and cpu/gpu discrepencies in it. Development of the Drag and Drop GUI. Solving problems with keras cpu/gpu differences, and tensorflow backend problems. We learned to collaborate. We also learned various new tools for available for neural networks programming and also about the problems associated with them. At present, a number of features are stuck in demo-mode: we don't yet accept external datasets (just MNIST, CIFAR-10, and a Reuters dataset), our GUI is not responsive, and the pricing model for deployment to SONM and Golem is not yet deployed. Ultimately, the hope is that this system can be more flexible than just Keras and these decentralized computing platforms. Perhaps it could generate an ONNX/NNEF model (even exported from Keras) that could then be imported into any deep learning framework and deployed to any computing provider, including AWS' spot marketplace, other cloud providers, and ML-specific services like FloydHub.